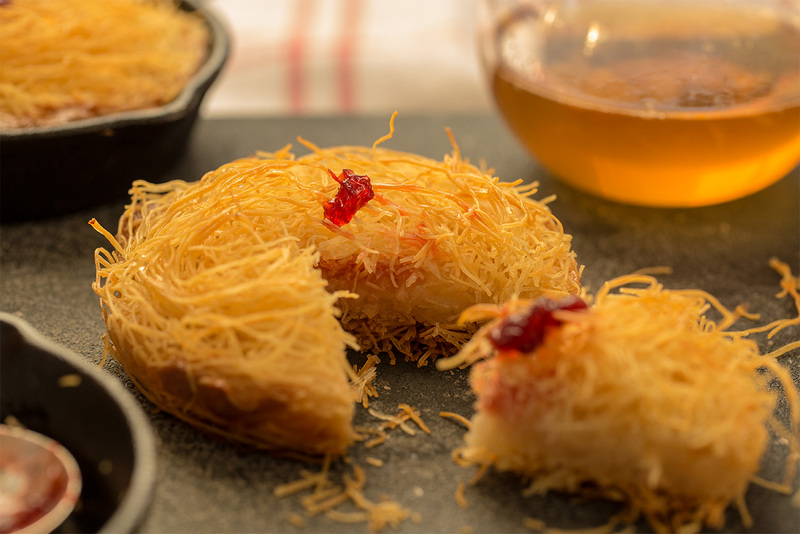 The mixture of cream filling and crunchy Kataifi strands give this dessert a fantastic texture. People who like it super sweet, add a drizzle of qa’ter or syrup made with sugar and flavoured with orange and rose essences. In Lebanon we usually cut the strands which actually makes it easier to spread them in the pan. I like to keep them whole, because they puff out to create volume. Use a heavy based oven proof tin or pan. Place the milk, cream and sugar in a deep pan and stir over medium to high heat until it starts it simmers. Slice away the bread crust and cut the bread into small pieces; add them to the milk mixture. Stir with a wooden spoon until the bread melts and the sauce thickens, for about 8 minutes. Place the mastic granules in a mortar together with ½ teaspoon of sugar. Crush to a fine powder. Combine mike powder, orange blossom water, and rosewater with the simmering milk. In a separate bowl dilute corn flour with a little cold milk and incorporate it into the creamy mixture. Stir continuously with a whisk until you achieve a thick paste much like Greek yogurt. Set aside until it cools, mixing it from time to time to prevent a film for forming on the surface. 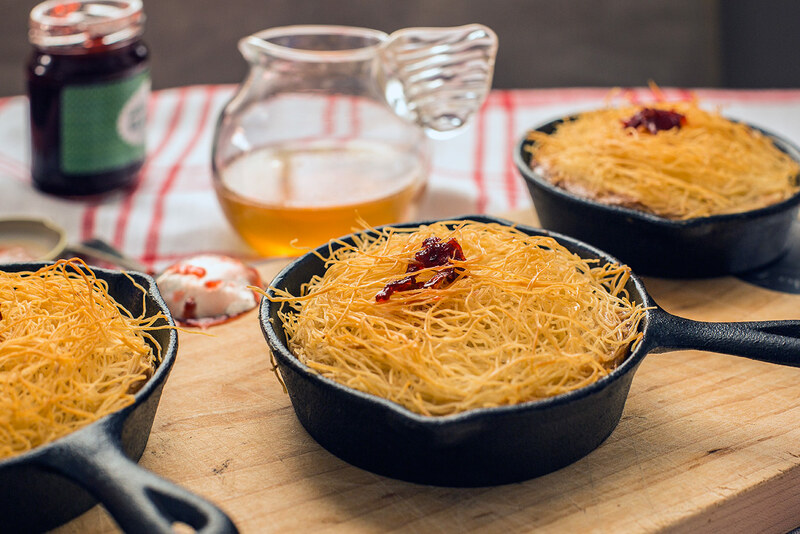 Place the kataifi in a bowl and sprinkle with a teaspoon each of rosewater and orange blossom water. Separate and losen the vermicelli strands until their volume appears to have doubled. Pour the melted butter over them and rub with your hands to ensure all the filaments are coated. Separate the the kataifi in two piles. Pack one half of the vermicelli into a 30 cm round baking tin. Spread the cream over the base and smooth it with the back of a spoon. Lay the second pile of vermicelli over the filling making sure it is covered evenly and press lightly with the back of spoon. Bake for 35 minutes; the surface should by then be an even golden colour. Serve warm or at room temperature with fragrant syrup.